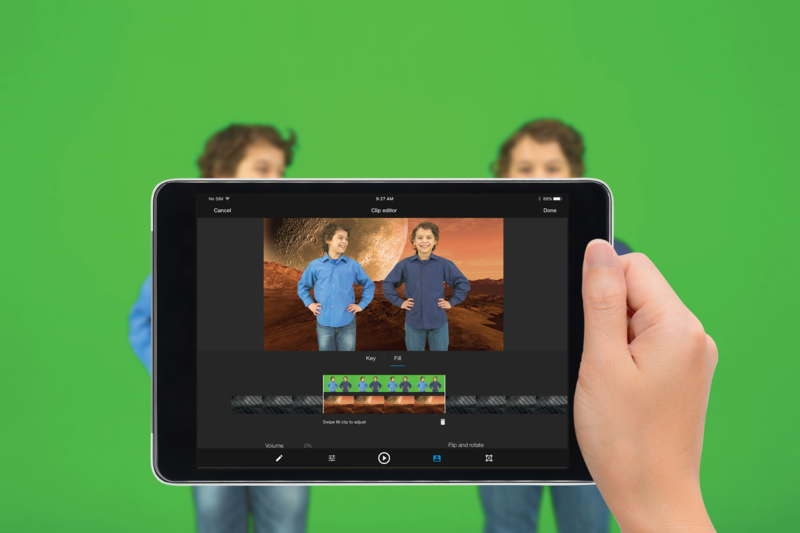 Menlo Park, CA - August 16, 2017 - WeVideo today announced a powerful addition to its leading video editing app for iOS with the immediate availability of Hollywood-caliber green screen special effects directly within its top-rated movie making interface. 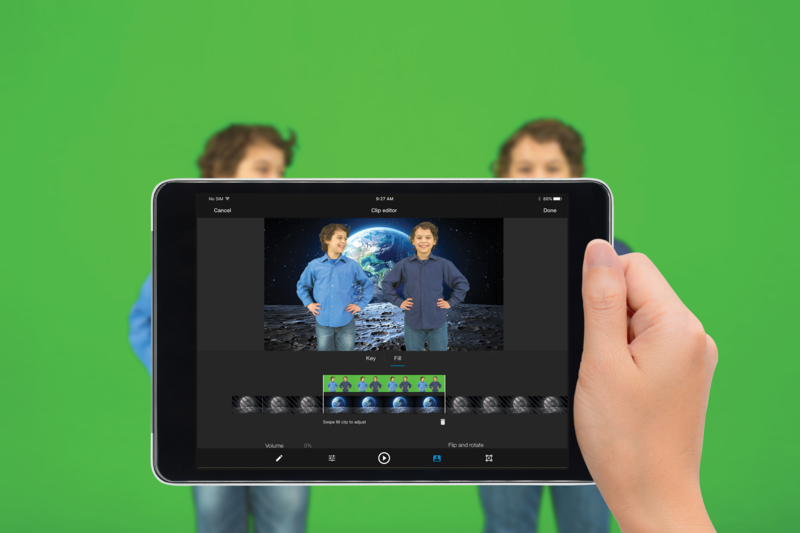 The full-featured WeVideo iOS app includes the new green screen tools seamlessly within a complete video editing and movie making solution. The new feature, also known as chroma keying, enables users to remove a color from the video and replace that color with any videos or photos of their choice. This professional technique makes it easy for the user to blend videos of a person or an item with another layer of video. It is how TV news and weather, movies and video games make their subjects appear to be standing in front of a blowing storm, a martian landscape or any other locale one can imagine. 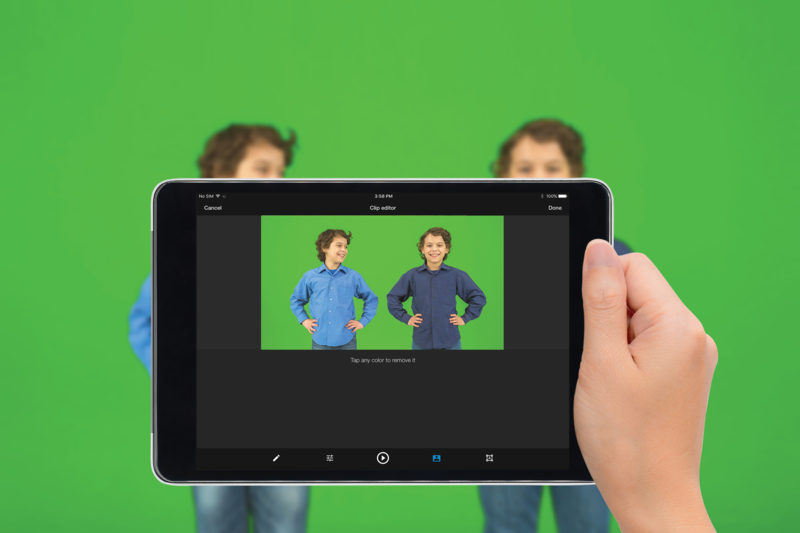 WeVideo CEO Krishna Menon said, "With WeVideo's new green screen effects, any iPhone or iPad user can now quickly turn ordinary video into something unique, exotic and eye-catching. Whether you plan to share your video on social media or play it on your 4K screen, WeVideo results look like nothing else on iOS. That's because the WeVideo green screen is a seamless feature within a complete video editing system that you can carry anywhere. A rich creative palette lets you create stunning layered videos on your iOS device. You can do even more by taking what you create on your mobile device and enhancing it further in the WeVideo web editor." WeVideo's video editor for iPhone and iPad is the easiest, fastest and most fun way to capture, create, view and share amazing movies on the go. With WeVideo, users don't need advanced skills to quickly create remarkable videos for fun, school, or business. The WeVideo app makes it easy to combine video clips, special photos, sound, themed music from the included library, as well as the user's own music from their device. Users have complete creative control over text, transitions, slow motion effects, voice-overs, and numerous special effects. Movies created with WeVideo are easily shared to popular platforms including YouTube, Facebook, Twitter, Instagram, and more. Projects created on WeVideo's video editor for iOS can be completed on the mobile device or easily handed off, for even more detailed creative manipulation and control, to the desktop browser-based WeVideo web app. WeVideo's web-based application works on any browser and provides users with an extensive creative palette for video editing, motion graphics, advanced green screen, special effects, speed control and more. WeVideo lets the user freely mix and match more than 600 audio, video, and graphics media formats and supports video resolutions up to a stunning 4K. Since all the heavy computer processing demands of video editing are handled in the Cloud, every user gets the benefit of a world-class editing workstation, anytime, anywhere. WeVideo's web-based application works on virtually any Apple, Windows or Google Chromebook computer, and there is never software to install or update. WeVideo projects can be accessed anywhere, at any time, on any device. Finished projects can be streamed from the web, shared online, or saved offline to watch on TVs, projectors and other devices. WeVideo offers iOS users free, introductory accounts that let people begin to explore many of its powerful features. Users can upgrade for $3.99 to a one year mobilepass that delivers the complete, premium WeVideo for iOS feature set including green screen effects. WeVideo also offers flexible individual subscription options that combine the complete premium iOS app experience with WeVideo's full-featured web-based application for use on laptops and desktops, starting at just $4.99/month. WeVideo also offers specially priced Education subscriptions to fit classrooms, schools and districts, as well as state- and national-level deployments. Every WeVideo subscription includes a deep suite of video editing and creative tools, cloud storage, and much more, with support for browsers as well as mobile apps on Android and iOS.